Review written by and copyright: Rick Curzon (15th March 2019). 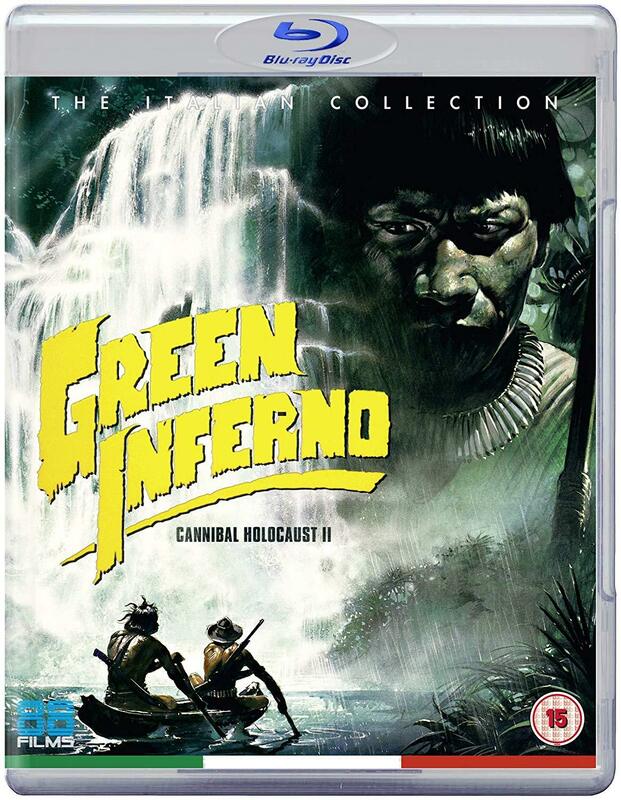 For years fans waited for the release of a sequel to Ruggero Deodato's trendsetting CANNIBAL HOLOCAUST (1980) yet it would take almost a decade for THE GREEN INFERNO, also known as CANNIBAL HOLOCAUST 2, to arrive... and it was not, perhaps, what followers of the cycle in Italian nasty native movies were expecting! Whilst Deodato's original benchmark critiqued the mondo film pseudo-documentary phenomenon, partly instigated by cinematographer and director Antonio Climati (MONDO CANE / SAVAGE MAN, SAVAGE BEAST), here the focus turns to satirising the hypocrisy and complexity of CANNIBAL HOLOCAUST itself! Directed by Climati, CANNIBAL HOLOCAUST 2 sees some enterprising adventurers traipsing into the Amazon jungle in search of a missing professor and, in the interim, the youngsters encounter some indications that slavery and European colonialism is still robbing the Colombian rain forest blind! A mix of macabre images, scenic locations, castrations and sly in-jokes, CANNIBAL HOLOCAUST 2 introduces some belated bad taste humour into familiar jungle territory and requires immediate reappraisal from tribal terror completists - which is a meal best served in glorious HD by the video nasty enthusiasts at 88 Films!! A group of journalists and anthropologists travel deep into the Amazon rain forest to find a lost academic. Directed by Antonio Climati who'd worked on many mondo films prior to this, but he seems to have had an epiphany regarding the moraly questionable nature of those productions and of the more extreme, morally dubious Italian cannibal films. This one has the leading characters saving animals and helping to capture monkeys for scientific observation. The violence is strong at times although mostly not all that gory or lingered over. Nor are there any scenes of sexual violence; after all this has been certified only 15 by the BBFC. The pace is lanquid which works agianst the film at times but it's beautifully shot on real Amazonian locations. It was shot in English albeit with the actual soundtrack being post synced. A gorgeously lensed film with a naturistic and brightly warm palette; this looks the peach in HD and is a worldwide Blu-ray premiere. 88 Films have lavished this bubblegum film with a first rate transfer, high bitrate and a good encode. No signs of clumping, digital splats or holes in the copious grain field. A very film like presentation. Black levels are heavy and satisfying with no signs of unintended crush to be seen and the contrast keeps the image perky and filled with detail. No blown out highlights or problems that I could see. An excellent transfer with only the odd speckle to mar a perfect rating. Italian seems to have been the language spoken on set and is the preferred way to view the film. The lips sync up better in that track although neither is spot on. The Italian track is more elegant and more robust and for viewers out there familiar with Italian genre efforts of the era you know what to expect. Dialogue is clear and always audible, music never interferes but is well represented. Sound effects are well rendered for such a flat track typical of it's era. Subtitles are essential and most welcome. An entertaining excerpt from the 2015 documentary directed by Eugenio Ercolani and Guiliano Emanuelle. This covers all the usual bases for the cannibal film genre with plenty of talking head interviews and clips. Sadly, this isn't the whole thing runs a whopping 150 minutes according to IMDB. What it says on the tin; opening credits from the Italian version under the original title: Natura Contro (Against Nature). Standard trailer of the period and genre. Cheezy! These three items weren't provided for review. Another winner from 88 Films and worldwide Blu-ray debut. Great picture and sound and the extras - although not overwhelming - are solid and enjoyable. Highly recommended and it's region free so non UK residents can purchase.